Washington, D.C. — The AFL-CIO union representing 23,000 farm workers in the Midwest and North Carolina has endorsed the Labor-Community Campaign for an Independent Party, launched in September by the Movement for a People’s Party and The Organizer. The Farm Labor Organizing Committee approved the resolution at its executive committee meeting over the weekend in Toledo, OH. The union is headed by co-founder Baldemar Velasquez, an elected member of the AFL-CIO’s Executive Council since 2009. A leader in the Labor Party of the 1990’s, Velasquez was one of the driving forces behind two groundbreaking AFL-CIO resolutions passed at its October 2017 convention calling for a break with “lesser of two evil politics” and the exploration of a labor party. The FLOC union joins a dozen organizations, hundreds of union organizers, labor leaders, and leading intellectuals like Dr. Cornel West and Chris Hedges in endorsing the creation of a new labor-based political party. Velasquez was an early endorser of LCCIP in September along with other labor leaders such as Secretary-Treasurer Chris Silvera and his Teamsters Union 808, Long Island City; the Labor Fightback Network; Nancy Wohlforth, secretary-treasurer emerita with the Office and Professional Employees International Union, founder and board member of Pride at Work, former AFL-CIO executive council; Donna DeWitt, former president of the South Carolina AFL-CIO and chair of the SC Labor Party; and Al Rojas, co-founder of the United Farm Workers of America with César Chávez. Incensed by the injustices suffered by his family and other farmworkers, Velasquez founded FLOC in 1967. 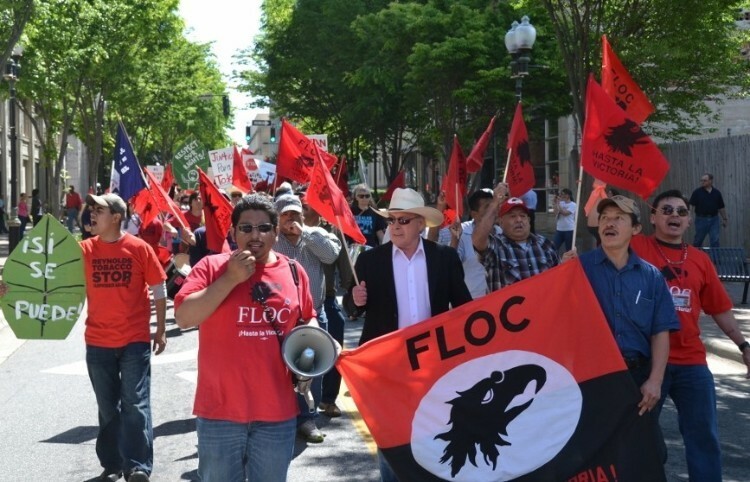 Under his leadership, FLOC has set international precedents in labor history, including being the first union to negotiate multi-party collective bargaining agreements, and the first to represent H2A international guest workers under a labor agreement. Since April, FLOC has been leading a national boycott of VUSE, the best-selling American e-cigarette brand owned by British American Tobacco, formerly Reynolds American Inc. The tobacco company refuses to sign an agreement with FLOC guaranteeing farmworkers the right to unionize and negotiate better working conditions without fear of retaliation. The boycott marks an escalation of an 11-year fight against BAT/Reynolds — the largest tobacco company in the world — as it seeks to improve workplace safety, protect against human trafficking, and secure collective bargaining for thousands of farmworkers who toil in the tobacco fields of the South. President Velasquez is an internationally recognized leader in the farmworker and immigrant rights movements. His commitment to justice and human dignity has led to awards by many labor, government, academic and progressive organizations, including the John D. and Catherine T. MacArthur Fellowship (Genius Award) and the Aguila Azteca Award, the highest honor given to a non-resident by the government of México.